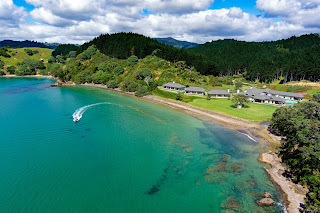 In the northeast corner of New Zealand’s North Island lies Helena Bay Lodge. The property features three kilometres of pristine coastline , four private beaches and many intimate coves. National Geographic Traveler Magazine ranked this location second-equal in The World’s Top Rated Islands, Coastlines and Beaches. This region has a long history of both Maori and European habitation; there are literally thousands of archaeological sites in Northland. The coastline boasts many prominent Pa sites (former Maori fortifications). There are five Pa sites on Helena Bay Estate. An archaeologist’s estimate suggests that up to 250 people may have called this land their home. With the direct access to the ocean providing an abundant food source and the terrain affording excellent defence, this is not surprising. There is clear evidence of cultivation on the property, with Kumara pits and terraces still visible today. During the Lodge construction two Ko (Maori digging instruments) were unearthed and sent to the National Museum for preservation. The first Europeans here were of Croatian decent. In the early days, Helena Bay had a first-class reputation for wine production. Focus on the farm soon moved to dairy and sheep, followed by establishing pine forestry and dry stock. The Maori name for Helena Bay is Mimiha, named after a small black fish. The Helena Bay name came from the first European woman settler, Mrs Helena Hutchinson. She and her husband Charles had the first store at The Bay. Mrs Hutchinson was a kind woman who worked with local Maori, teaching and nursing. That they eventually named the bay after her shows the deep respect in which she was held. Helena Bay has followed the typical “boom and bust” cycles of farming in Northland. The property was cleared for farming around 1910 by Benjamin Le Clerc Senior and Ben Le Clerc Junior. The Le Clerc family were early settlers and contributed significantly to the development of the area. The property was first used as a runoff for the main farm, but in 1931 when Ben Junior married it became his farm and he moved there with half of his father’s stock – 80 cows in total. In 1960 Ben Junior’s son Peter married and, as was the tradition, he took over the Helena Bay farm. In the early 1970s Peter amalgamated the two farms, moving the dairy operation to the original farm. Helena Bay was converted to a sheep farm which it remained until the 1980s when due to economic factors the decision was made to revert it to a dry stock farm. In 1987, after 27 years of farming the property Peter Le Clerc retired. The property was purchased by stockbroker Mike Daniels who decided to retrench and gave up the lease on the “Mohei” block. Like many New Zealand farmers, he was drawn into the potential returns offered by plantation pines and he planted 90ha of pines on the property which remain today. The poor returns of coastal farming limited the investment that could sensibly be made into the property. In 2007 Helena Bay was purchased by the current owners. A new lease was entered into with the owners of the Mohei block bringing the farm back to its original size of 304ha (750 acres) allowing for lower intensity farming. A Wagyu beef breed program was introduced in partnership with New Zealand’s leading Wagyu breeding co-operative Firstlight. The pine forest was assessed and registered for carbon consumption and took on a new role as a carbon sink rather than for pine production. The property consumes 50,000 tons of carbon per annum making Helena Bay very carbon negative.